Written for both the client and the clinician this book is in 3 parts. 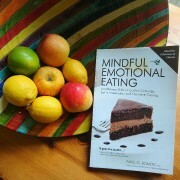 In the first part the author describes his model of working to enable ‘Mindful Emotional Eating’ (MEE). The second is how to develop clients so they can manage situations of relapse without them becoming catastrophes, and the final part describes more specific approaches to four more common emotional eating situations. I was disconcerted by Somov’s style and selling technique apparent in part one. He is using this book to teach other clinicians tools to help their clients, and it initially felt like a product promotion. However, with perseverance I continued. The tools described are based on the neuroscience as well as the philosophy of Mindfulness. Mindfulness per se is not touched on, and the readers are not expected or encouraged to seek mindfulness as a way of being. Somov describes how each of the 4-5 sessions planned for clients should run. He outlines his rationale, starting with reframing emotional eating, as either something to do mindlessly or mindfully. Identifying that we all have, by our nature as animals, strategies to preserve our own life; and emotional eating is a harm reduction strategy. Abstinence (aka dieting, and avoiding food) takes away emotional eating as a harm reduction strategy, leaving us exposed, and so diets are likely to fail. Throughout the book he emphasises that the client’s understanding of the shift in how they approach their eating behaviours is key. Breaking down the feelings of guilt and failure which often arise when giving in to a desire to emotionally eat, and replacing then with acceptance and permission. 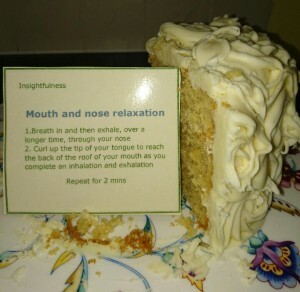 The training is about doing emotional eating, mindfully and not mindlessly. He provides tools to enable choice. Initially teaching relaxation, quick, bottom up relaxation, engaging physiologically with the parasympathetic nervous system, so humming or blowing out forcefully as an exhalation. Second are skills, he describes as choice awareness training, to ‘stay awake’ for example using the wrong cutlery, different plate, wrong hand. Thirdly, ‘craving control training’ similar to a 3-minute breath meditation although described as a river bank exercise, focusing more on the impermanence of feelings and thoughts, watching them go. During this course clients are encouraged to engage with their ‘fullness’ either physically or emotionally, and given permission to carry on if they are not ready to stop. This second part, in my eyes, parallels the outcomes of mindfulness, creating a space for choice, appreciating the impermanence of thoughts and promoting self-awareness/acceptance. Or the greater our awareness of what drives us to eat combined with the belief that we do our best in the moment will increase self-acceptance, and this is likely to decrease the need to emotionally eat mindlessly. In part 2 ‘motivational innocence’ and ‘effort acceptance’ are described more fully. One interesting idea related to dieting, or being abstinent, is that our brain is using stores of glucose to provide this self-control. The more we try to control ourselves; deny impulses, the more our brain responds by sending messages that we need something sweet, an energy fix. Giving in to a sugar fix is therefore an appropriate physiological response to the work we are doing marinating resistance, we can give ourselves permission to respond in this way without guilt, making a conscious choice to have a piece of chocolate or similar. This is an empowering shift. He describes binge eating and how it might manifest either a result of the inability to cope emotionally-striving to feel good, or as a desire to feel numb, without emotions. Somov is realistic about the struggle people have with relapse. He describes working collaboratively, supporting clients as they are able to apply more frequently and consistently the mindfulness techniques described in Part 1 which bring clients into the moment, encourage space between the feeling and the impulse and allow for self-acceptance, if in that moment, their effort was not what they had hoped for. He finishes part 2 with information about Eastern traditions and philosophies about eating, including the extremes of Jainism, achieving the state of Santhara, fasting to the point of death. Finally, Somov provides some useful interpretations to manage emotional eating for boredom and emptiness, sadness and grief, anger and fear, and stress. Helping clients understand at a fundamental level what these emotions represent and how food is providing a ‘harm reduction’ strategy, and learning to eat mindfully rather than mindlessly. 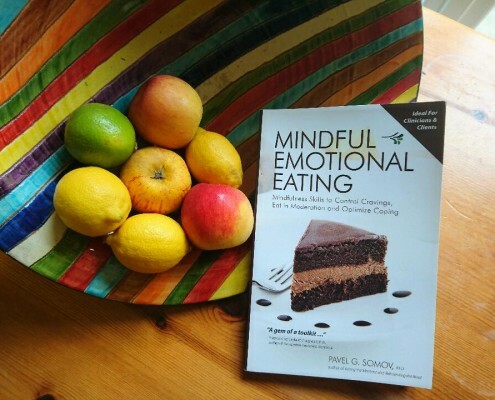 This book grew on me as I began to see how mindfulness was being used in a genuine way to help clients move from mindless eating to mindful eating. I would recommend it to health professionals wanting to engage with clients in a real, humanistic way. This book is not about losing weight. If you have an issue with emotional eating this book will help, however, agreeing with the author, I would strongly recommend having the support of a buddy.